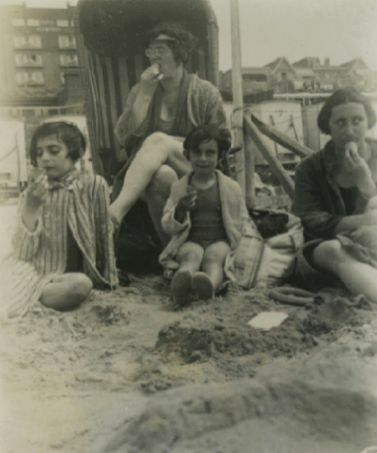 March 1933, the last picture taken of Anne, Edith, and Margot Frank in Germany, prior to emigrating to Holland. Anne is 3 years, 9 months old. 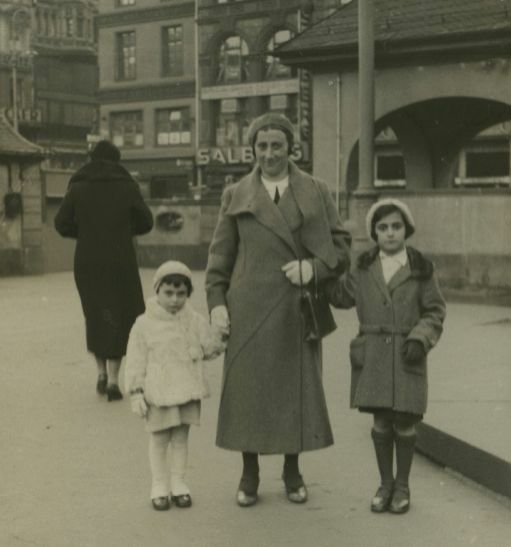 They are standing in the Hauptwache square in the center of Frankfurt am Main. I will start by sketching in brief the story of my life. My father was 36 when he married my mother, who was then 25. My sister Margot was born in 1926 in Frankfort-on-Main, I followed on June 12, 1929, and, as we are Jewish, we emigrated to Holland in 1933…. Once Hitler was appointed Chancellor on January 30, 1933, Nazi Germany became too dangerous for the Franks, simply because they were Jewish. The Nazis believed that Jews were subhuman and were bent on driving them out of Germany. The Nazi propaganda machine went full bore, inciting the German people to violence against the Jews, their neighbors and fellow citizens. At the helm were Joseph Goebbels, the Nazis’ main propagandist, and Julius Streicher. 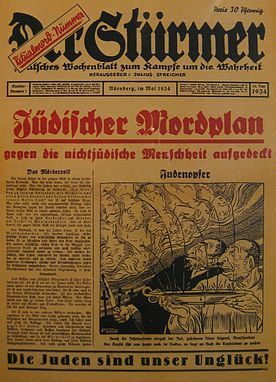 Goebbels and Streicher fomented lies about the Jews, making them the scapegoat for Germany’s poor economy and its humiliating defeat in World War I. They told the German people that the Jews were their enemies and not rightful citizens of Germany. In the first few weeks of his chancellorship, Hitler gained complete control of the police force, stripping regular uniformed police of the power to defend law-abiding citizens against unreasonable search, seizure, and arrest. He expanded the notoriously brutal Gestapo, his state secret police, and unleashed them and his other thugs with full power to seek out any suspected enemies to his leadership and detain them, without trial. February 1, 1933. 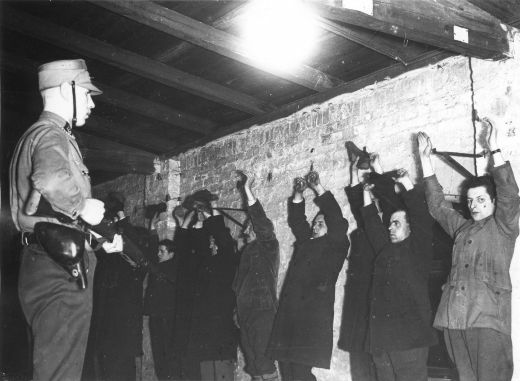 One day after Hitler becomes Chancellor, the Sturmabteilung (SA), the Nazi paramilitary group known as “the brownshirts” round up suspected Communists. Organized attacks on Jews broke out across Germany. Since the local police had no power, the Jews had no one to turn to. 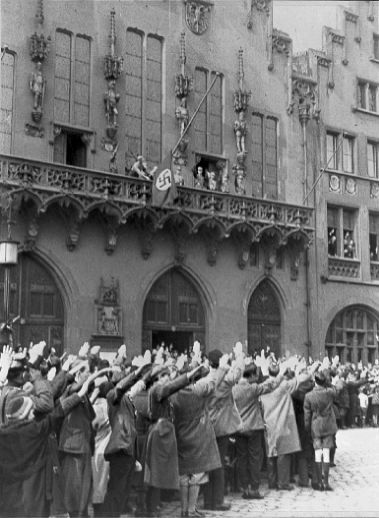 Then, on April 1, 1933, the first officially-sanctioned national attack on German Jewry was held. 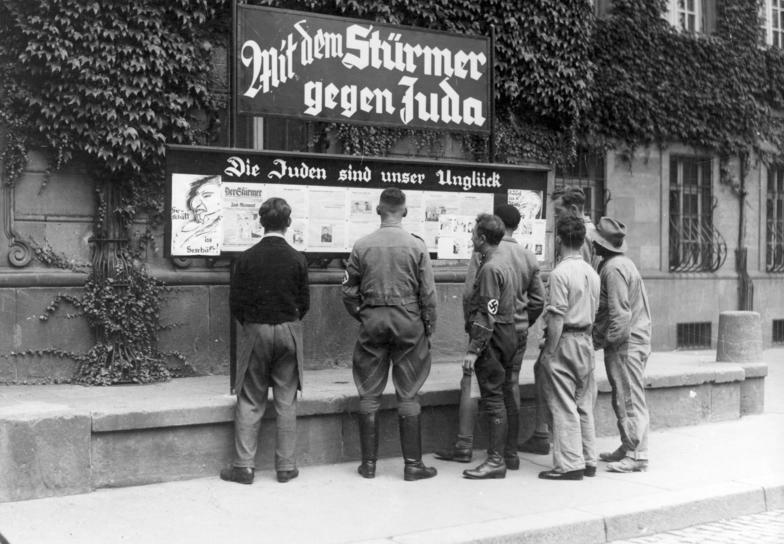 Organized by Streicher, it called for a boycott of all Jewish businesses. Armed Nazi guards were posted in front of every Jewish business, intent upon blocking all clients from entering. The businesses were marked with yellow Stars of David, and trucks drove through the streets sporting anti-Jewish signs. Windows were shattered, business owners attacked, and stores plundered. Hitler needed a place to stash his “enemies.” Two months into his chancellorship, he built Dachau outside of Munich, the first of many concentration camps. Through his brother-in-law, Frank was able to set up a business in Holland. By the end of 1933, his wife Edith and daughters, Anne and Margot would join him there. They were running from Hitler, but he would catch up with them later. He was not satisfied in just driving the Franks and all Jews out of Germany. He wanted to completely annihilate them. He would hunt them down across Europe and kill them until, in April 1945, the madness finally stopped. 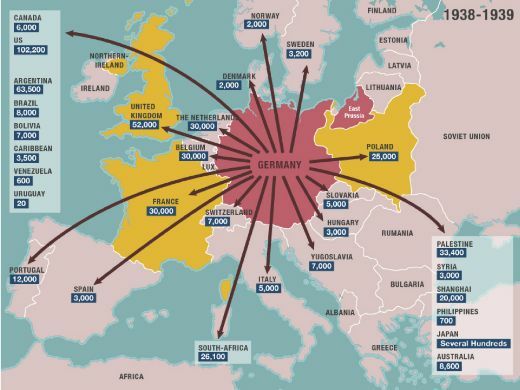 Between 1933 and 1939, more than half of the 550,000 Jews living in Germany had fled. 1. Frank, Anne. Anne Frank: The Diary of a Young Girl. New York: Doubleday, 1952. 2. Pryce-Jones. Unity Mitford: A Quest. London: Weidenfeld and Nicolson, 1976.
the title underneath the map should read “Between 1938 and 1939” – it reads “1933 and 1939” .